Seniors, age 65 or older can ride any Fixed Route FREE with a Senior Transit Pass. Call 570-839-6282 x434 to request an application or download the application. The Half Fare for the Disabled and Medicare Card Holder Program is to assist qualified persons with their fixed route transportation needs at a reduced fare. To use the program, you must present either a Medicare Card or Reduced Fare Identification Card along with a photo ID to the driver when boarding. If you are disabled, but do not have a Medicare Card, you may request an application. In instances where persons are not physically able to access the fixed route and live 3/4 of a mile from the fixed route service, they may be provided door - to - door service if determined eligible through an evaluation by an MCTA provided physician. Route Deviation Service are available to persons with disabilities whose disability prevents them from getting to a regular bus stop. Under safe provisions, Route Deviation permits a fixed route bus to leave its route to provide Origin to Destination service up to 3/4 of a mile without additional cost. 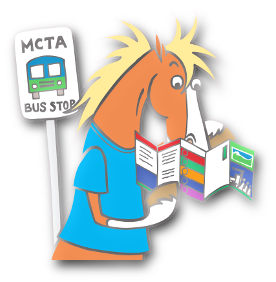 MCTA created Braille Route Cards to help indviduals with visual impairments identify the route and direction they wish to travel. Braille Route Cards help drivers assist passengers to board the correct bus with ease. Commuter Services helps commuters find carpool partners (through our confidential ridematching database) and provides advice on successful carpooling (including “Meet Your Match” days at some employer sites). Even carpooling with just one other person could cut your costs in half. If you carpool at least twice a week, we provide you with a reimbursement for an emergency ride home. Walking is a commuting option that can significantly reduce your commuting costs and be part of a program for better health and fitness. Walking also reduces traffic, which helps to improve air quality. Employers can help encourage their employees to walk to work by offering lockers and showering and changing facilities. Commuters who share a ride to work, use transit, walk or bike have a common concern, “What do I do in an emergency?” For commuters in Adams, Berks, Carbon, Cumberland, Dauphin, Franklin, Lancaster, Lebanon, Monroe, Perry, Pike, Schuylkill, and York counties who are enrolled in our free service, an Emergency Ride Home is the answer. This page will answer most of your questions on the program. Click here for much more information about MCTA's ADA Complementary Fixed Route Service program. You will receive your pass in the mail. Simply present your pass to the driver when boarding. PO Box 339134 MCTA Dr.
Or use this handy Complaint Form to get the job done. Please note, only original documentation will be accepted. You will receive your Reduced Fare Identification Card in the mail in approximately 14 business days. Half Fare for Riders with Disabilities Application. *There are four Adobe Acrobat files in a zipped file. Route Deviation Service are available to persons with disabilities whose disability prevents them from getting to a regular bus stop. Under safe provisions, Route Deviation permits a fixed route bus to leave its route to provide Origin to Destination service up to 3/4 of a mile without additional cost. For more information on this service, call (570) 839-6282 x 1. Public Transportation is a major key to independence, productivity and community participation for people who are visually impaired. 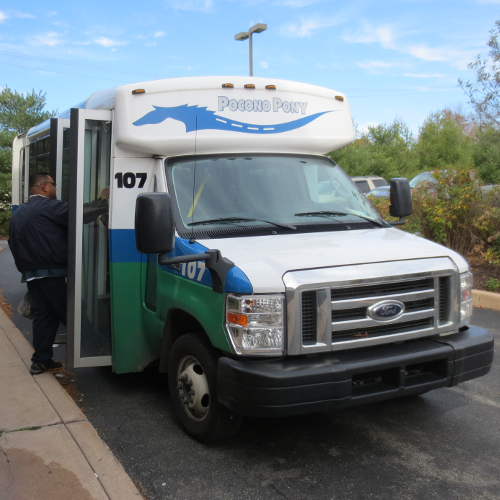 With the help from members at the Center for Vision Loss located at 4215 Manor Dr., Stroudsburg, MCTA created Braille Route Cards to help indviduals with visual impairments identify the route and direction they wish to travel. Braille Route Cards help drivers assist passengers to board the correct bus with ease. Braille Route Cards are available free of charge by calling the marketing team at (570) 839-6282 x 425. In instances where individuals, qualified through an evaluation process, are not able to access the fixed route and live up to 3/4 of a mile from the fixed route service, they may be provided door - to - door alternate service. This service is provided during the same days and hours the fixed route program operates using shared ride buses. If there is no fixed route service in an area during the time an individual seeks to access the service, the trip will be denied. 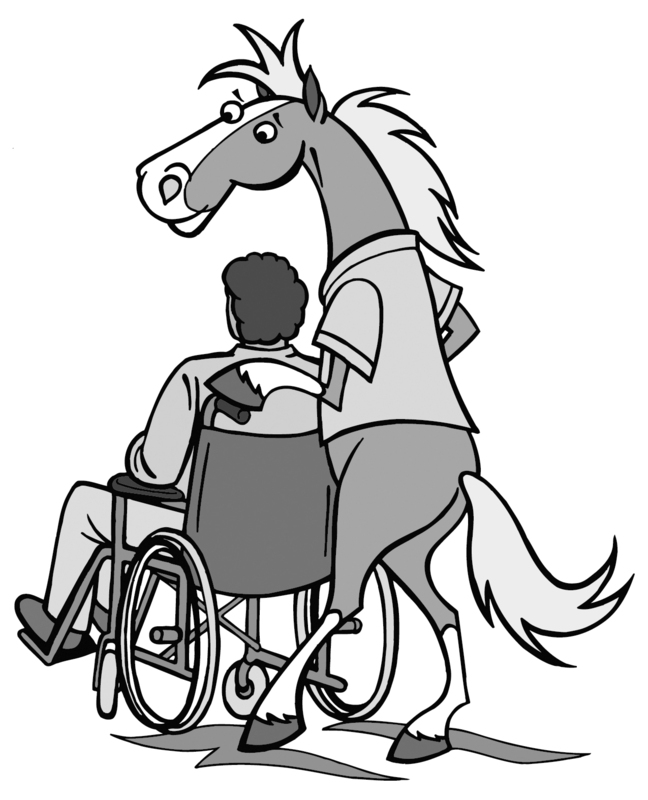 However, individuals may be eligible for the Persons with Disabilities Program through the Shared Ride program. Fares / Each Way Fares are $3.00 per trip. Escorts / Personal Care Attendants Permitted Free with verification that a rider is unable to use the program without assistance. Companions / Family / Friends Permitted Yes, but must pay the same fare as the enrolled participant. Areas Served Only those areas up to 3/4 of a mile along the MCTA fixed route during those days and hours of service. Participants must book a reservation by 4:30 PM the business day prior to their trip using our website, email, or phone number at (570) 839-8210 x 1. For example, if you'd like to travel on Friday, call the MCTA Call center by 4:30 PM on Thursday. MCTA may negotiate the pickup and drop off times if we are unable to accomodate your request, but can not deny the trip. Only those trips that have origin and destinations within 3/4 of mile of the fixed route during the hours of operation of that particular route will count as an ADA trip. When traveling on the ADA Complementary Fixed Route Program, the fare for each trip is due at the time of boarding. Please have the exact fare available for the bus driver, as they do not make change. Do not provide the bus driver the fare for all the trips you plan on taking for the day, as you may have another driver and bus for your return trip. 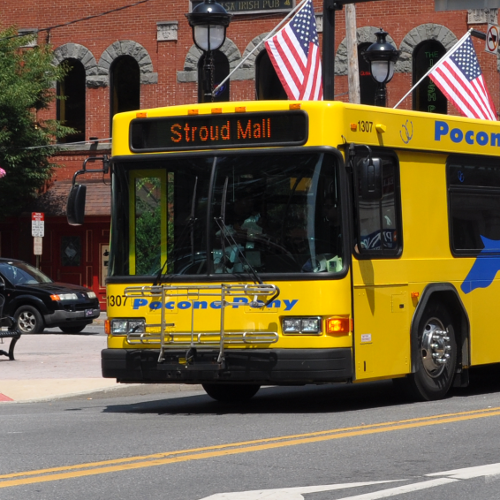 If you are visiting the Pocono's and are registered in an ADA Complementary Service with another transit system, MCTA can provide service. Please send verification from your local system prior to your visit or bring it with you. 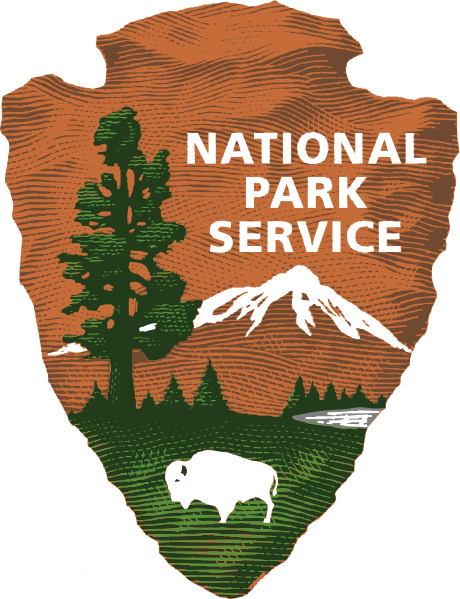 If you do not have service in your area, but feel you may qualify for service during your visit, please contact Sharon at (570) 839-6282 x 434 to get more information. Guests will be provided provisional service up to 21 days in a 365 day period, without an application or statement of service from their local transit system. MCTA has the right to ask for verification, "such as a letter from a medical professional or eligibility for other services based on a determination of disability,"1 if the disiblity is not apparent. Please note, only original documentation will be accepted. Please contact our program specialist at (570) 839-6282 x 434 for additional information.